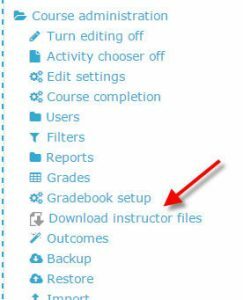 Moodle has a new feature to allow faculty to Download all Instructor Files for a Course. Navigate to the Course Administration Block within the course you wish to download files. 3. Click the icon to Download. 4. A zip file with all files will be created for archive. 5. If there are no instructor files for that course, you will receive the following message.